Demron technology is specifically engineered to combine radiation protection with “ease of use” in order to maximize effective radiological defense. Extremely fine, small metals are woven into fabric and those metals block radiation, as well as chemical and biological agents. The Demron Full Body Suit is constructed with an integrated hood, heat sealed seams, and seam seal tape for added protection. The suit was engineered for evacuation in a dispersed low energy environment. Due to advanced molecular design, the Demron coverall allows for better heat dissipation, providing the user with a cooler core environment. It is class 2 full body CBRN suit. It is engineered to provide universal protection against chemical, biological, non ionizing radiation, and ionizing radiation. 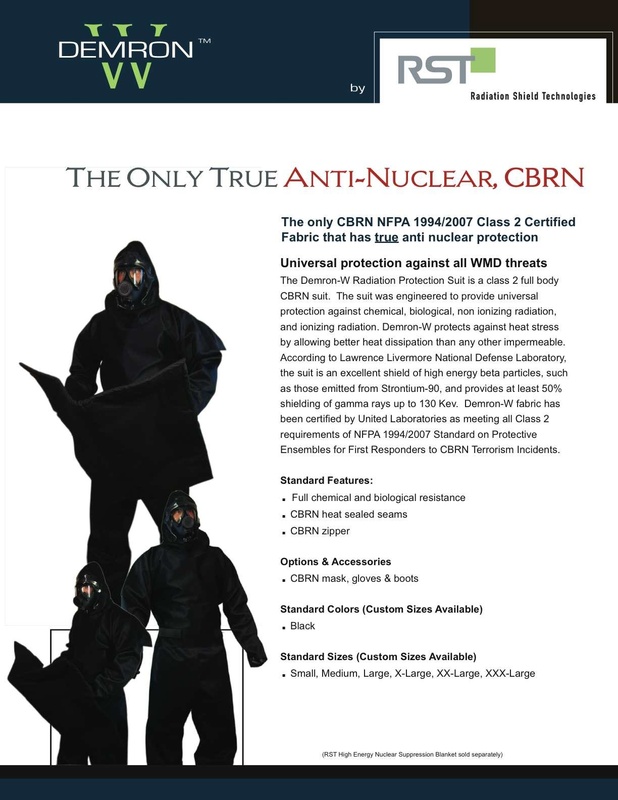 It is made out of CBRN NFPA 1994/2007 class 2 certified fabric that is anti-nuclear. Options & Accessories: CBRN mask, gloves & boots. Custom sizes available (S-XXXL). •Comfortable and breathable •Excellent shield of high-energy beta particles. •Provides at least 50% shielding of gamma rays up to 130 Kev. •Provides greater safety for faster response during emergency threats.